Directed by Lav Diaz, Mula Sa Kung Ano Ang Noon is ultimately masterful: its direction, cinematography, set design and the acting are topnotch. (Left frame) Karenina Haniel's character is seen naked in one of the crucial scenes while Hazel Orencio is distraught. Karenina (right frame) is very believable as the autistic sister. A voice-over at the start of Mula Sa Kung Ano Ang Noon informs viewers that it is from memory. But whose memory? Is it from director Lav Diaz, whose slow cinema has been recognized worldwide? Or is the story from the minds of the characters, whose ideals and well-being were tested in the film’s almost six-hour run? Perhaps it is more appropriate to consider that Mula Sa Kung Ano Ang Noon is a collective memory of Filipinos, to whom Lav Diaz has been dedicating his movies for years. Mula Sa Kung Ano Ang Noon is about martial law. The black-and-white film details the decay of a remote village during the 1970s, prior to Ferdinand Marcos’ chilling proclamation placing the Philippines under his dictatorship. The villagers begin to witness strange things: houses are being burned down, wails can be heard from the forest, there are cows being hacked to death, and a man in found bleeding to death at a crossroad. Every character is significant in painting the movie’s political climate. Hakob (Reynan Abcede) is the crafty orphan who exhausts all means to see his parents who are supposedly stashed in another island. Sito (Perry Dizon) is Hakob’s cynical adoptive father who keeps dark secrets. Horacio (Noel Sto. Domingo), a writer returning to his homeland, is hopeful despite his terminal illness. Itang (Hazel Orencio) teeters on the brink of hopelessness, but desperately hangs on to take care of her autistic sister Joselina (Karenina Haniel) until she finally snaps. Father Guido (Joel Saracho) looks after the well-being of the sisters even as he looks after the well-being of the villagers as they deal with the growing presence of the military in their village. Tony the winemaker (Roeder Camañag) commits an abominable act as he assaults Joselina. He will later engage in revisionism to justify his crimes in his deteriorating mental state. Heding (Mailes Kanapi) peddles her wares around town while spreading rumors to intentionally cause discord. She steals every scene that she is in and often elicits chuckles from the crowd because of her silly antics that turn out to have a sinister motive. But nature is the most important character in the movie. 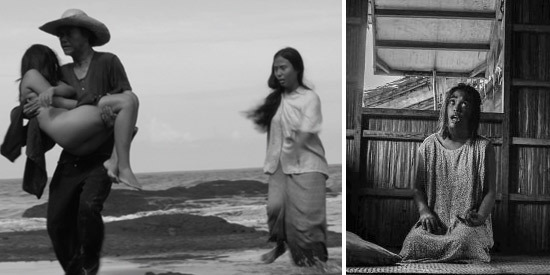 Lensed in gorgeous black and white by cinematographer Lav Diaz, the movie’s surroundings establishes the film’s dark hymn. It is nature that gives Mula Sa Kung Ano Ang Noon its texture. It demands that the characters acknowledge its presence: the waves threaten the lives of Itang and Josefina who occassionally pray at Poong Bato (Holy Rock), rivers ebb and flow whenever a tragedy occurs, and the wind blows silently when everything’s at peace. Hazel Orencio revealed to PEP in an interview that Lav Diaz allows his actors to improvise their scenes while the cameras are rolling. This may allow for more naturalistic performances, but it also makes it harder for the actors to portray the roles since there is little direction. It is thus admirable that each actor were able to perform remarkably. Most outstanding is Karenina Haniel, whose portrayal of the mentally-ill young woman Joselina convinced critics in Locarno that she isn’t acting at all. It is more exceptional because the actors were also a part of the filmmaking team’s skeletal staff. Hazel, for instance, was able to carve out an award-winning performance while being the film’s assistant director. She won the Boccalino de Oro Independent Critics Award for Best Actress at the Locarno International Film Festival. Meanwhile, the film known internationally as From What is Before, brought unprecedented honor for the Philippines when it bagged the coveted Golden Leopard or Pardo d’oro at the 67th Locarno International Film Festival. Mula Sa Kung Ano Ang Noon was screened at SM Mall of Asia Centerstage last Sunday, September 21, coinciding with the 42nd anniversary of the declaration of martial law in the Philippines. The cinema was jampacked, and the movie got a thunderous response when it ended. It deserved the applause. Mula Sa Kung Ano Ang Noon is ultimately masterful: its direction, cinematography, set design and the acting are topnotch. And the fact that the accolades came from the local audience is what makes it all the more sweeter. After all, the movie is about Filipinos’ recollection of the past, and how we recall it. Ed's Note: The "PEP Review" section carries the views of individual reviewers, and does not necessarily reflect the views of the PEP editorial staff.